Asia Cup 2014 is the 12th edition of Asia Cup One Day International Cricket tournament starting from 25th February 2014 to 8th March 2014. 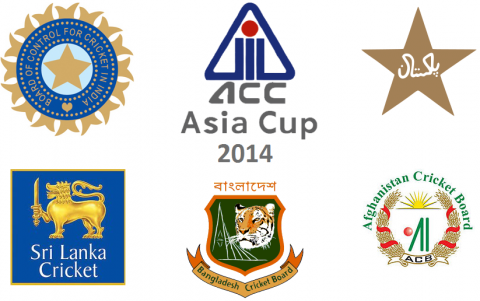 Asia Cup 2014 involves five teams of Asia (India, Pakistan, Sri Lanka, Bangladesh And Afghanistan). Below is the updated points table of Asia Cup 2014 Tournament. Asia Cup Cricket 2014 Points Table: The team will be awarded points at the end of the match on Asia Cup ODI Cricket 2014 as per the following rules. Bonus point will be awarded to the team that will get a run rate of 1.25 times that of the oponent. 1st Match Asia Cup 2014 Pakistan vs Sri Lanka (PAK vs SL): Sri Lanka Won by 12 Runs. 2nd Match Asia Cup 2014 India vs Bangladesh (IND vs BAN):India won by 6 Wickets With 6 Balls Remaining. 3rd Match Asia Cup 2014 Pakistan vs Afghanistan (PAK vs AFG): Pakistan Won by 72 Runs. 4th Match Asia Cup 2014 Sri Lanka vs India (SL vs IND): Sri Lanka Won By 2 Wickets With 4 Balls Remaining. 5th Match Asia Cup 2014 Afghanistan vs Bangladesh (AFG vs BAN): Afghanistan won by 32 Runs. 6th Match Asia Cup 2014 Pakistan vs India (PAK vs IND): Pakistan won by 1 wicket with 2 balls remaining. 7th Match Of Asia Cup 2014 Sri Lanka vs Afghanistan: Sri Lanka Won by 129 Runs. 8th Match Asia Cup 2014 Pakistan vs Bangladesh: Pakistan Won by 3 Wickets With 1 Ball Remaining. 9th Match Of Asia Cup 2014 India vs Afghanistan: India Won by 8 Wickets With 106 Balls Remaining. 10th Match Of Asia Cup 2014 Sri Lanka vs Bangladesh: Sri Lanka Won by 3 Wickets With 6 Balls Remaining.